Every child has a person whose story should be told, a person who has taught,cared-for, and loved them, a person whose influence and ability to inspire is trulyheroic. Encouraging students to talk with family members about their cultural heritage shows respect and interest in students' diverse cultures, making students and families feel more connected to the school. Families are offered authentic, academically oriented ways of being involved in the school without themselves needing to be highly proficient in English or numerous academic subjects. Writing projects that illuminate diverse cultural traditions allow all students to share and learn from each other, while heightening respect and appreciation for diversity and improving school climate. Students' writing connects them to their families and communities in diverse and creative ways. Families can support and provide experiences for their children to write about, and they themselves can participate in the story process by being storytellers or audiences. 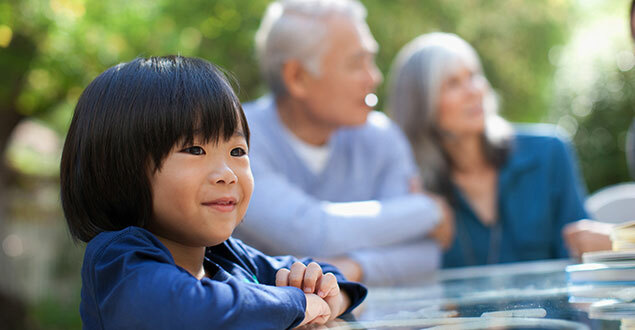 Children love to listen to stories, sharing time and family history with the parent or grandparent who tells them. Listening to these stories, children learn the structure of narratives and the many ways of relating meaningful and engaging thoughts and events. The first time I assigned the biographies I envisioned students researching a notable person, probably someone unrelated to themselves. You can imagine my surprise when at least two-thirds of the class chose to write about members of their own families. I was horrified since each student presents a twenty-minute oral report about her biographical subject. How many grandmothers could we stand to hear about! How wrong I was. First, I was and continue to be amazed at the relatives that my students have. They come with stories that amaze, complete with documentation in old pictures, diaries, awards. I ask them to read at least one book that will familiarize them with the context of their subject's life. Much of what I discovered about the depression I learned through research in books, which is a shame — I didn't take advantage of family history that surrounded me for many years. I'm afraid that when I was younger and my grandparents and parents would start to talk about their lives during the depression, my eyes would glaze over and I'd think, "Oh, no, not those boring tall tales again!" … Now I feel a real sorrow when I think of all the knowledge, wisdom and stories that have been forever lost with the deaths of my grandparents (p. 242). He urges young people: "Go talk to Grandma and Grandpa, Mom and Dad and other relatives and friends. Discover and remember what they have to say about what they learned growing up. By keeping their stories alive, you make them, and yourself immortal". Teachers can help their students embrace this advice by respecting the fundamental importance of family knowledge to the academic curriculum. One teacher asked her American history students to interview their parents about the civil rights movement when the class was studying that period. She then invited parents of diverse groups to share their experiences in class (Jackson, 1998). Here we see the families not simply feeding and nurturing the students' growing sense of who and what they are, but evolving from "just family" into knowing experts in their children's eyes. Kids love learning about the rich culture we have here at Tulalip. They feel pride; they see themselves as leaders. Culture motivates them to learn. For many of these kids, when they realize that their family and the canoe culture is something they can share in the classroom, that's when they realize they have powerful stories to tell that they are excited about telling. Honoring families' heritage language. Offering parents whose native language is not English the opportunity to participate in their child's education is yet another critical element in the potential for story projects in any classroom. Students build bridges between their classrooms and their home cultures, integrating all aspects of themselves into their education. Simultaneously, as their cultures are connected to their classwork, their fellow students gain knowledge of diverse cultures, languages, customs, histories, and experiences. By positioning ethnic and cultural diversity as critical and respected realms of knowledge and experience, children's cultural differences are understood as strengths from which to build knowledge and skills, and they promote cross-cultural understanding among their classmates. Dyson and Genishi (1994) write: "By connecting to kids' cultures, one not only recognizes and honors the communities to which they belong; faith, cultural, ethnic, interest … you also allow a community to be forged among the students in the class". In Medford, Oregon, teacher JoAnna Lovato has developed a project with her seven- to -nineyear- old Latino students in which they read autobiographies, write their own and family stories, and create a colorful laminated paper "wheel" that carries the stories and images of their lives. "One of the beauties of this project," she observes, "is that it fully embraced my students — their language, culture, and family traditions. They loved it because it was about them, and they all took great pride in their projects". Similarly, fifth-grade teacher Stephanie Windham has found that her Family Story Book project has helped students improve their writing skills, learn about the genre of story writing, and-most important-develop a sense of pride about their own lives. The children at Atkinson Elementary School in Southeast Portland come from Latin America, the former Soviet Union, and countries such as China, Vietnam, and Pakistan. The project involved writing a story based on the stories told by their own families, as well as a poem on the theme "Where I Am From." They then selected one piece to take through the revision and publishing process. Through the project, Windham has found that family members, especially those unfamiliar with American schools, gain confidence and a better understanding of their child's education. The father of a Russian student, in his struggling English, made a point to contact Windham after the project in order to tell her "it is good you teach this, having children come to ask their parents questions. You are teaching the right things". Researchers have found that the most powerful form of parental involvement occurs when parents are actively engaged with their children in ways that enhance learning (Thorkildsen & Stein, 1998). Projects such as these offer ways for non-English speaking parents to participate in their children's education, and motivate non-English speaking students to convey who they and their families are to the English-speaking community. Students learning English as a second language can interview family members in their home language and write their family stories in English, perhaps sharing the stories with classmates in two languages. Students have opportunities to read, write, and speak both their home language and English. I had to ask a lot of questions of my parents and I was surprised about how much I didn't know. It was really interesting because I didn't know that when my grandma talks, when my great-grandma talks, I didn't realize that saying "I used to do that when I was your age" was considered a story. It was really interesting. By encouraging and providing opportunities for meaningful family involvement, teachers play a critical role in bridging home and school. In the small, rural town of Copper Center, Alaska, Tamara Van Wyhe, a secondary school English teacher, engages her students in creating an annual publication of poetry and prose that is shared with the community in a year-end celebration. Through the writings, Van Wyhe says she has developed a greater understanding of the strengths of her students' families and how they support their children's learning. She says this new knowledge has even changed the focus of her parent newsletter-moving away from "look what the school is doing for your child" to "thank you so much for all you are doing to help your child learn". Stucynski, A., et al. (2005). Tapestry of Tales: Stories of Self, Family, and Community Provide Rich Fabric for Learning. Northwest Regional Educational Laboratory: Portland, OR. As a community counselor with an interest in working with children and families, I can see myself using family history writing projects like those mentioned in the article with my clients. Engaging the client with their family and the family in the client's therapeutic process through writing would not only provide me with insights into the family's culture, but also help me identify the family's strengths as well as encourage family bonding. Using a strengths-based approach would encourage further development or use of those healthy behaviors with the parents and the client. I personally believe counseling children and adolescents cannot achieve long-lasting, healthy results without also working with the family. A project like the ones mentioned above would encourage discussion between parent/s and child, promote self-esteem, and help the family identify the strengths of their family system. With activities like this, counselors can change the world! In relation to the writing assignment about biographies, I wanted to share one of my favorite assignments that I ever did as a kid. I wrote and autobiography when I was in about 5th grade. I had to "research" a little with my parents. They told me stories about me when I was born and when I was too young to remember. This reminded me of the way the teacher asked her students to do a biography and the students picked their family members. I think doing a non-fiction book about the student's family would be beneficial. This could get the whole family involved in the student's writing and reading. Also, sharing the stories with the class will encourage the student's to use imagination. I think this is a great way to get the children started on creative writing. As a counselor-in-training, I have learned how important it is for a family to get involved with a child's schoolwork. This is a good way to connect with the family as well as enhance writing and reading skills.